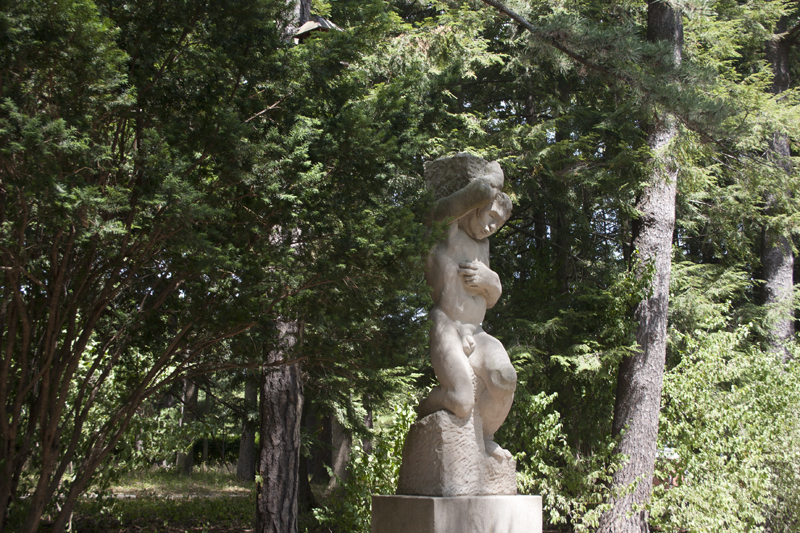 Artist Glyn Warren Philpot (1884-1937) sculpted the two limestone figures, which stand at approximately 7'6" high. The artworks were gifts of Robert Allerton in 1946. 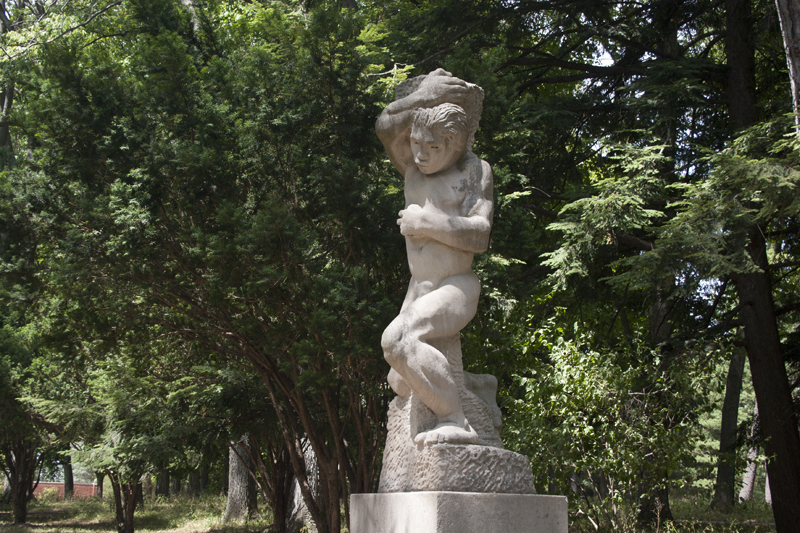 When Glyn Warren Philpot was Allerton's houseguest in the autumn of 1921, he had an estate employee pose for him in order to conceptualize a figure he planned to include in a British mural commission on the birth of man. 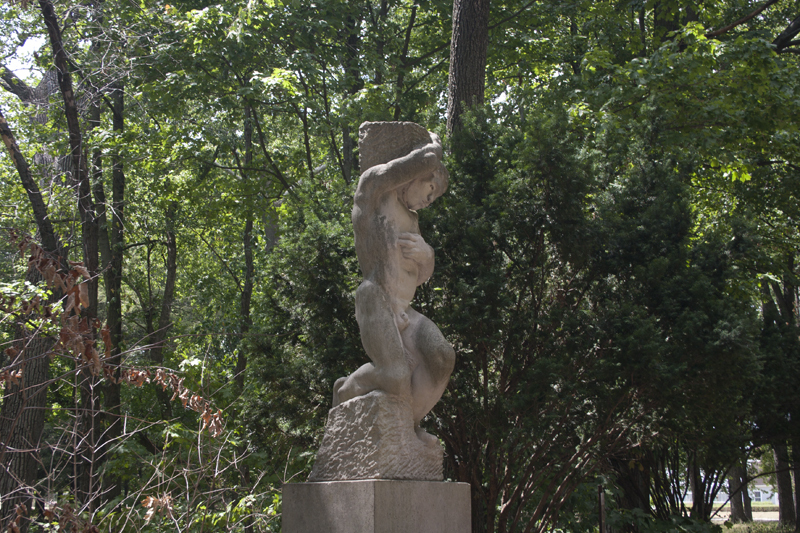 Allerton used the resultant plaster sketch, thought of as nothing more than an intermediary stage to a finished work, as the basis for these big stone statues he had a stonecutter carve the following year. The two husky, rather blocklike male nudes push great chunks of land or rock from their shoulders as they laboriously emerge from the earth. Considering Allerton's penchant for graceful, pleasant pieces, especially in that early period, the ponderous, broadly expressed prehistoric men with rough, even crude facial features and anatomy seem anomalous. 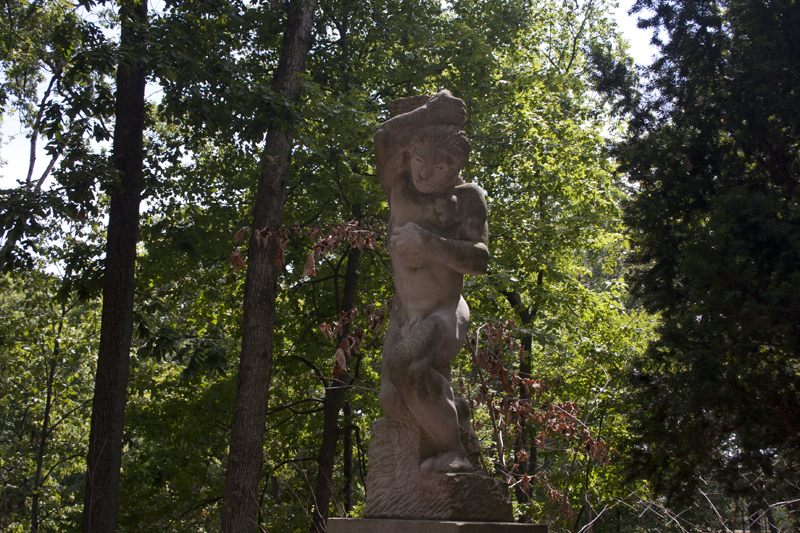 Yet the theme of human creation must have continued to interest him, for in 1924, just two years after installing the Philpot figures, he bought the "real thing," as it were: Rodin's superb bronze masterpiece of the vivifying first human, the Adam of 1881, which Allerton later gave to the Art Institute of Chicago-and soon after, had copied in stone for his own grounds. Philpot enjoyed a successful career as a painter and sculptor in London after study at the Lambeth School of Art and in Paris at the Academie Julian. From 1904 he regularly exhibited allegorical subjects and portraits at the Royal Academy, and in 1927 he executed a mural for St. Stephan's Hall, Westminster. His elegant Portrait of a Man in Black in London's Tate Gallery is actually a painting of Robert Allerton, done on a visit to The Farms in 1913. 515 Old Timber Rd, Monticello, IL 61856 ~ These pieces can be found on the pathway leading from the Reflecting Pond to Brick Wall Garden. Muriel Scheinman, “Primitive Men, 1922,” ExploreCU, accessed April 22, 2019, https://explorecu.org/items/show/43.